Newmans Coachlines has been at the forefront of New Zealand passenger transportation since its humble beginnings in 1879, the last remaining Newmans Coachlines services between Christchurch, Tekapo, Twizel, Cromwell and Queenstown is now operated by InterCity Coachlines and Queenstown to Wanaka, Haast, Fox Glacier and Franz Josef is now operated by Great Sights. With the combined national InterCity Coachlines and Great Sights bus, coach, scenic coach and scenic tour services, including InterCity Coachlines coach services from Christchurch to Tekapo, Twizel, Omaramara, Cromwell and and Great Sights scenic tour services between Christchurch, Tekapo, Mt Cook, Cromwell, Queenstown and Queenstown to Wanaka, Haast, Fox Glacier, Franz Josef and Greymouth connecting with the Tranz Alpine train to and from Christchurch, you can choose from over 130 national daily regional and long distance bus, coach services including the TranzAlpine train and and inter-island ferry services between the North and South Islands, travelling to more than 500 destinations throughout New Zealand - 365 days a year for your convenience. By using the FareFinder located on the left of this page - you can search online for departure times, fares and make instant confirmation reservations for all InterCity and Great sights bus, coach and scenic touring services through out New Zealand including the TranzAlpine train and ferry services between the North and South Islands. For pick ups and drop offs from Christchurch International Airport, for InterCity services between Christchurch, Lake Tekapo, Twizel, Wanaka and Queenstown, type or select 'Christchurch Airport' in 'From' and/or 'To' field of the Fare Finder.on, using the FareFinder - type or select 'Christchurch' in the 'From' field and type or select 'Wellington - Central' in the 'To' field as your destination. With a 'Book As You Go' bus and ferry pass, you can travel at your own pace on the InterCity Coachlines and Great Sights national travel and sightseeing networks. 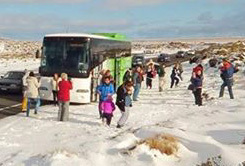 Passes are sold in blocks of travel 'Hours'', allowing you to travel on regular InterCity bus/coach services, North and South Island island ferry services and on any Great Sights premier scenic coach and sightseeing services in any direction as many times as your hours allow for up to 12 months from date of first travel.